I have complete confidence in using Dr Myerson as a cardiac physician. He has been unfailingly courteous, helpful and extremely pleasant to me. This was during some very stressful family illness, when I particularly appreciated his great kindness and help. I graduated from Bristol University Medical School in 1993. After completing my general medical training, I took up a post as a cardiologist in Oxford in 2001 and became a consultant in 2007. 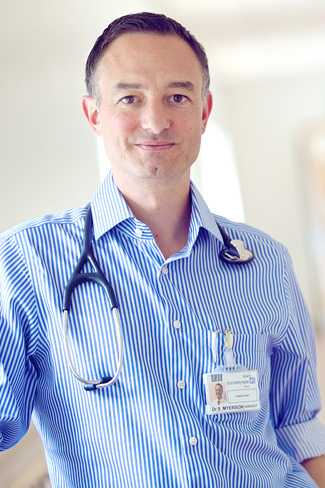 I provide specialist cardiology care and advice for NHS and private patients in Oxford and I am the head of cardiac imaging and cardiac physiology at the John Radcliffe hospital, specialising particularly in cardiac diagnostic testing, cardiac MRI and echocardiography. I am fully trained in all necessary aspects of modern practical cardiology and have personally performed over 5000 MRI, Echo scans and other diagnostic procedures during the course of my career. I am also an associate professor in cardiovascular medicine at the University of Oxford, particularly known for my research work and expertise in cardiac valve disease and cardiomyopathy and aortic disease. My current research involves several studies into the effects of heart valve disease, including leading the large Oxford based OxValve project, as co-Principal Investigator. I am also a lecturer in medicine at St Catherine’s College Oxford where I supervise medical students in years 4-6 of their studies. I have published many papers on cardiology in my specialist field and am editor of several Oxford Handbooks, including Cardiovascular Magnetic Resonance, Valve Disease and a very successful handbook called Emergencies in Cardiology that is used by cardiologists and medical students as a reference text and has been sold around the world. I am a fellow of the Royal College of Physicians and a senior member of all of the national and international professional bodies in my specialist field, including the European Society of Cardiology (ESC), the British Cardiovascular Society (BCS) and the Society for Cardiovascular Magnetic Resonance (SCMR). I am also a board member of the British Society for Cardiovascular Magnetic Resonance. I also regularly act as an expert witness in legal cases requiring specialist cardiology input.